Meet and Greet on arrival at Bagdogra/Bhadrapur-Nepal-Transfer to Darjeeling, O/N Hotel. Early Morning Sunrise Tour to Tiger Hill at 4 am and on return visit Ghoom Monastery, Batasia Loop. 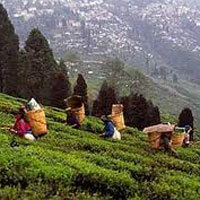 Breakfast:Darjeeling Seven points sight seeing from 8.30 am to 12.30 am, includes-HMI, Himalayan Zoo, Tea Garden, Tibetan Refugee Centre. Return to Hotel, Lunch. Afternoon Free. 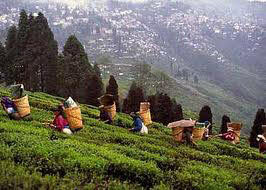 Departure for Gangtok via Peshok Tea Gardens. Drive 4-5 hrs-Check in the Designated hotel. O/N. Hotel. Day return visit to the Mountain Lake at Indo-China Border at 12400ft, Changu Lake. O/N at Hotel. Dep. for 1 night 2 days package tour to the Valley of Flowers at Yumthang, Halt O/N at Lachung. Package provides, all meals, accommodation on twin sharing, permits and sightseeings. Dep. for Yumthang Flower Valley after breakfast, via Singhba Rhododendron Sanctuary, return by Lunchtime after also visiting Hot Springs and return drive to Gangtok. O/N.Halt. Cherry City Tour from 9 am to 1 pm. Places includes-World Famous RUMTEK Dharma Chakra Centre, Tibetology, Govt. Cottage Industries, International Flower Festival, Do-Drul Chorten, Hur Hure Dara. O/N.Hotel. Return drive to Bagdogra/Bhadrapur. Trip Ends.